The Sedona International Film Festival is proud to present the Northern Arizona premiere of the powerful and acclaimed new film “On Her Shoulders” Dec. 8-12 at the Mary D. Fisher Theatre. “On Her Shoulders” has won numerous top awards in prestigious film festivals around the world and has garnered top critical and audience acclaim. Twenty-three-year-old Nadia Murad’s life is a dizzying array of exhausting undertakings — from giving testimony before the U.N. to visiting refugee camps to soul-bearing media interviews and one-on-one meetings with top government officials. With deep compassion and a formal precision and elegance that matches Nadia’s calm and steely demeanor, filmmaker Alexandria Bombach follows this strong-willed young woman, who survived the 2014 genocide of the Yazidis in Northern Iraq and escaped the hands of ISIS to become a relentless beacon of hope for her people, even when at times she longs to lay aside this monumental burden and simply have an ordinary life. This is a film that explores that space — the distance between the victim and her voice, the fragility of human emotions that both provoke and hinder positive change, and the unbelievable resilience of a woman willing to sacrifice herself to play the media game that is modern advocacy. 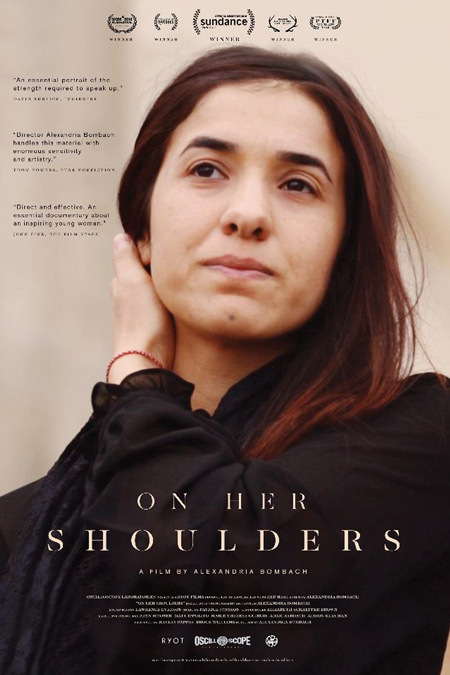 Nadia Murad was named the 2018 co-recipient of the Nobel Peace Prize. She is a human rights activist and the recipient of the Vaclav Havel Human Rights Prize and the Sakharov Prize, and the UN’s first Goodwill Ambassador for the Dignity of Survivors of Human Trafficking. She has also received the Clinton Global Citizen Award, the Peace Prize from the United Nations association of Spain, and was named 2016 Woman of the Year by Glamour Magazine. Together with Yazda, a Yazidi rights organization, Nadia is currently working to bring ISIS before the International Criminal Court on charges of genocide and crimes against humanity. “On Her Shoulders” will be shown at the Mary D. Fisher Theatre Dec. 8-12. Showtimes will be 4 p.m. on Saturday, Tuesday and Wednesday, Dec. 8, 11 and 12; and 7 p.m. on Monday, Dec. 10. Tickets are $12, or $9 for Film Festival members. For tickets and more information, please call 928-282-1177. Both the theatre and film festival office are located at 2030 W. Hwy. 89A, in West Sedona.